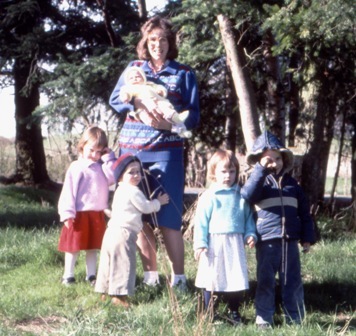 The children and I standing in our current front yard (before it was a front yard) a bit more than 18 years ago. I’m holding baby Kayla, then the children from left to right are: Sarah, Michael, Laura and Philip. Rick brought me to look at this property when Kayla was a little-bitty newborn babe. It was a fairly forested piece of property. Though it was wild, it had almost a park-like look to it. We both must have been very pleased with it, since we purchased it immediately, and then Rick set to work, building a home for us. He was working as a log home carpenter at the time. He would do that extremely demanding work all day, grab a quick bite to eat at a restaurant, and then come out to the property and keep working. I tried to bring the children out to the property fairly often so they could visit Daddy and see what he was up to. Once the basement was poured and the subfloor in place they figured the house was ready to move into, since it had a “roof”! I remember that they enjoyed riding their tricycles in that big, empty basement. That all seems like it was an eternity ago, since the little ones in the photo are now grown up, and living in their own places! What a wonderful time it was, though, full of much hard work, but work to which I gave myself joyfully. I am blessed! This entry was posted on Thursday, September 20th, 2007 at 9:15 pm	and is filed under Favorite Photos, Memories. You can follow any responses to this entry through the RSS 2.0 feed. Both comments and pings are currently closed. Thanks for the note. Laura sent me a link to one of your posts. I love reading your posts!!! Keep it up! Ah a timely picture. It’s amazing that we’re all out, isn’t it? I remember that time so clearly. Not all kids get to have the experiences we did! Hi, Laura. Remember how much you kiddos enjoyed watching Dad work? Do you remember the time of wanting to move into the basement once the subfloor was on?